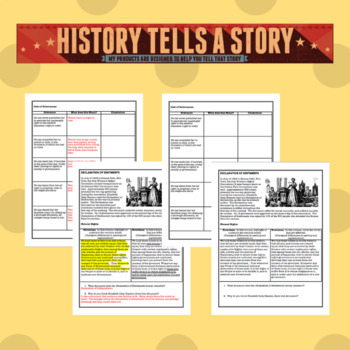 This product will give your students an understanding of the Declaration of Sentiments. It begins with a brief introduction, followed by a side by side comparison of an abridged version of the natural rights paragraphs of the Declaration of Independence and the Declaration of Sentiments. The second page allows students to analyze five of the grievances that were included in the document. There is also a link to a six minute video that matches well with this handout. I would love to hear from you when you get a chance. Get free stuff! Did you know that you get TPT credit for every dollar you spend after you comment on a purchase? It's an easy and inexpensive way to add to your teaching toolbox!